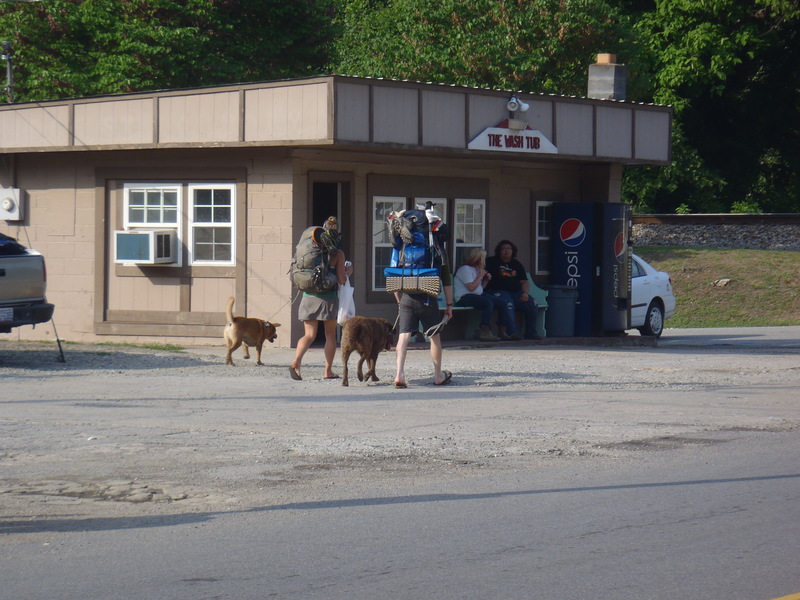 We walked into Hot Springs the morning of the 22nd and had great weather and the perfect location for one of our most productive town days so far. 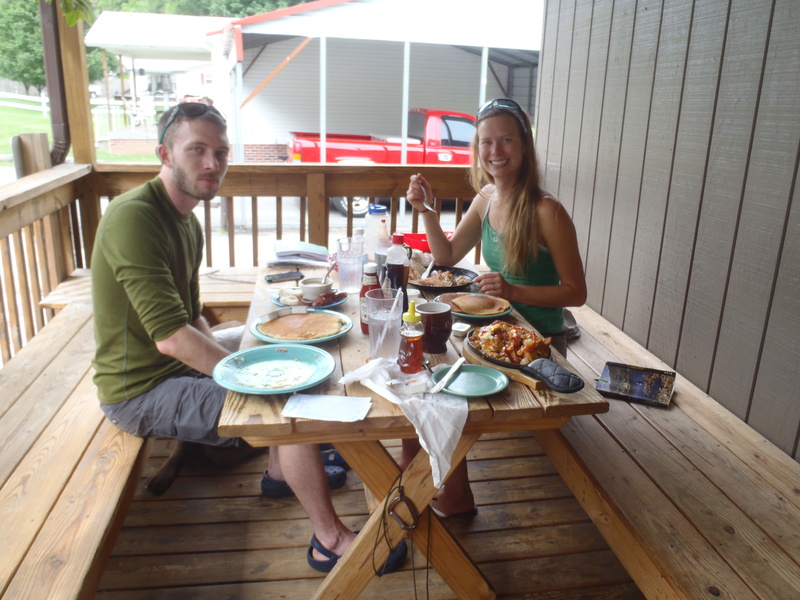 After taking a full two hours to eat and digest breakfast on the front deck of a little diner, we commandeered the porch of a “Closed for the Season” hiker ministry right on Main Street; I suppose coming into town at the tail end of the season has its perks! Since the AT literally runs down the sidewalk of Main Street Hot Springs we had the perfect location for conducting a day of errands, eating and drinking while letting the dog(s) relax in the shade. Unfortunately, we took the grownup approach a bit too serious and when we finally finished our chores for the day the ice cream shop was closed! Nonetheless, we still left town that night with full bellies because of a community dinner being held at the community center where hikers were invited to attend for a small donation. We feasted on a mainly 90% homemade vegan/vegetarian menu that tasted like it came straight from the garden. It’s a tough life we live! The next day leaving Hot Springs we woke up nice and early and started walking. Just the time that we made it to the top of the first mountain coming out of town a massive thunderstorm came in on top of us! Hunter had to experience walking in the rain at some point and after a dry four days at the start of his hike, the time had come. The rain came so quick we barely had time to find shelter and get our pack covers on and despite 30 seconds of chaos and confusion he followed us to safety near a stand of spruce trees. We tried to take pity on him and made him a house out of my sleeping pad so he could at least have a bit less of a traumatic experience in his first hail storm! After that one bad storm the weather seemed to cooperate with us for the rest of the walk to Erwin and besides a few warm afternoons we had very little to complain about. This section of the hike ended up being relatively uneventful and the scenery and vistas turned out to be very similar to the last 273 miles. It was still a beautiful walk through the “green tunnel” but since leaving Erwin we have been fortunate enough to see more than just uphill’s and downhill’s shrouded by Poplar and Oak leaves. One of the highlights of scenery came out of nowhere when an “easy three mile section” turned out to be a rocky and sun exposed boulder field along a high ridgeline. Despite the fact that it took some amateur acrobatics, three liters of water and a few dog passes to make it through the boulder fields, the views we had more than made up for the inconvenience. This was the first time since Clingman’s Dome we could look around for a near 360 degrees and see where we came from and where we were headed to. Times like this the true beauty of the Appalachian Trail comes out; ancient, rounded off mountains that gave up their rocky peaks for tree covered summits hundreds of thousands of years ago as they constantly faced the test of time. Views like that along the AT really let you know how short your years really are in the grand scheme of things!! The final highlight of this section came in the form of more trail magic. 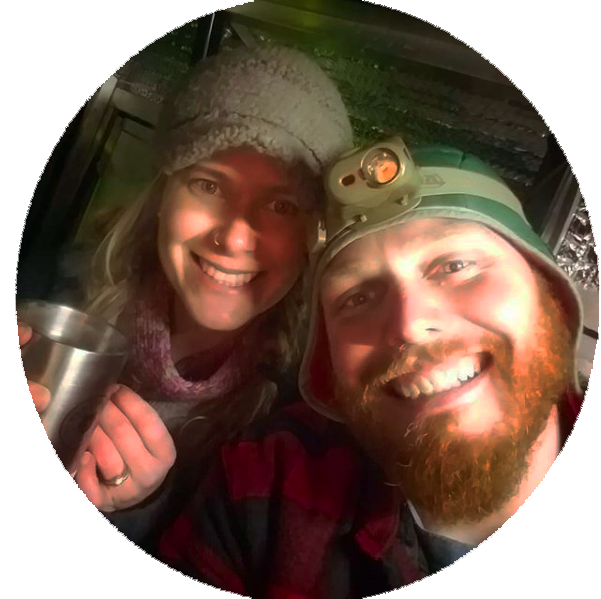 With our late start from Georgia plus taking a week off the trail we figured that our trail magic days were over and it would be a Pop-Tart and beef jerky filled trip to Maine. 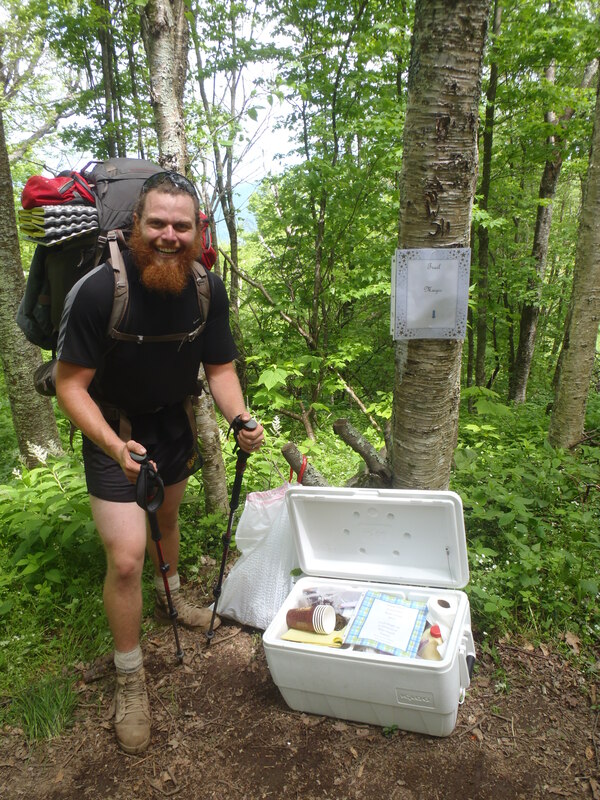 Apparently luck, or pity, is still on our side and we came across a fully stocked cooler sitting at the top of a four mile climb! 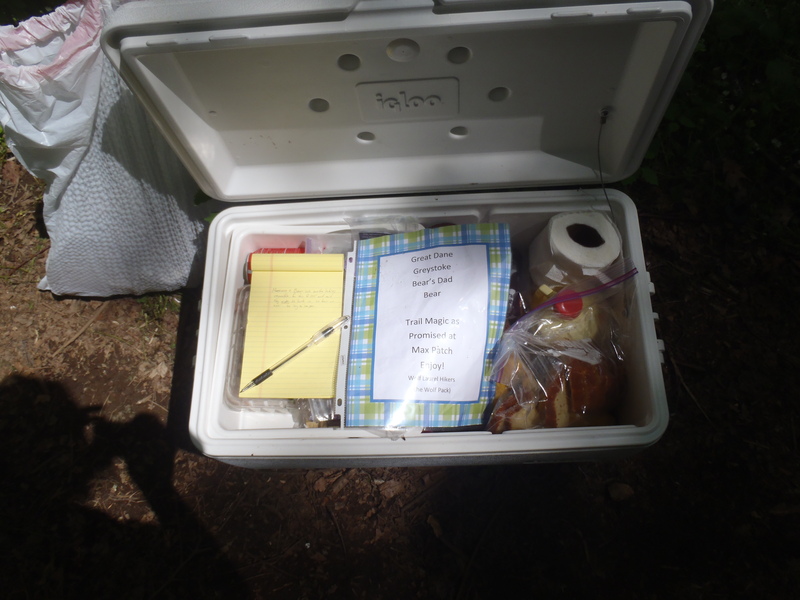 The cooler, which had been there for three or four days already had been consistently replenished and Lindsay, Hunter and I came up the hill to strawberries, hard boiled eggs, brownies and cold milk with fresh ice to keep it cold. They even put in some dog treets for the pooch, which he gobbled down without too many complaints! 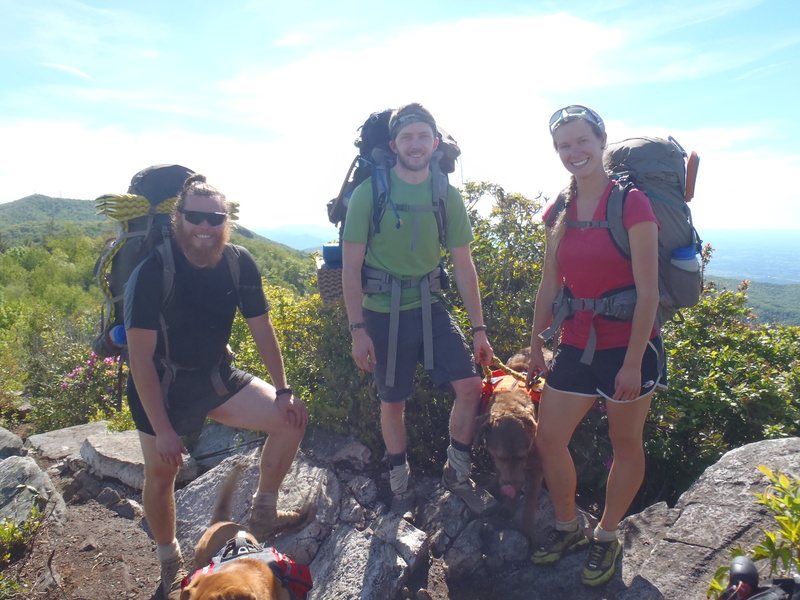 The good will of strangers and incredible experiences like this is exactly why we wanted to hike the AT and wouldn’t want to be anywhere else this summer.